A/W 2009-2010 was a season devoted entirely to Christopher Bailey menswear classics. In line with his vision of a 'disheveled elegance', Edwardian tailoring was combined with vintage-looking shirting to create a rock n' roll urgency, while Prorsum's typical outerwear was realised in a muted palette of charcoal, black and dark navy. Stylistically straightforward yet precisely on-point, the collection received tremendous praise from critics and fans alike. This shirt was one of the season's key pieces and was worn in many runway looks while also being prominently featured in the seasonal campaign. Its design encapsulates the season's sentiment by combining a casual cotton body with opulent jacquard detailing. The shirt is made from a finely woven cotton fabric with a soft texture and casual, organic appearance. The vintage crinkly texture of this fabric is juxtaposed by striking applications of luxurious jacquard panels on the plastron, collar and cuffs. This second fabric is structured, stiff and has a unique three-dimensional texture that gives the shirt a very luxurious appearance and feel. The cut of the shirt is slightly different from most Prorsum shirts, while maintaining the line's signature slim and elongated proportions. The shoulders are extremely narrow and defined; ease of movement is achieved by giving a slightly fuller cut to the top part of the sleeve. This nuanced detail is commonly found in dancers' attire and gives the shirt a very handsome fitted profile while making it surprisingly comfortable and easy to move around in. A runway close-up of a shirt in the same cut/fabric can be found here to demonstrate this unique cut. 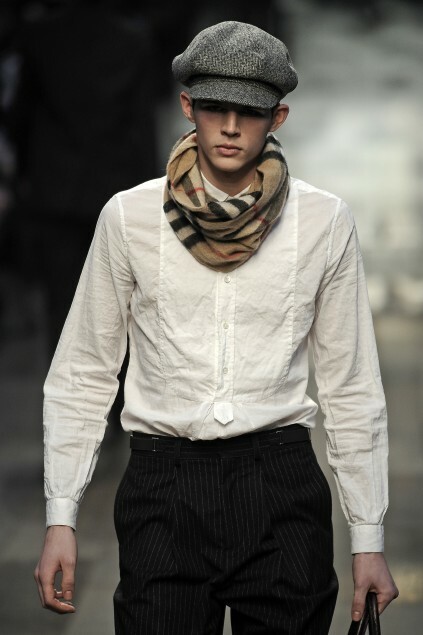 All Prorsum pieces are constructed to a much higher standard than other Burberry lines and this shirt is no exception. The jacquard parts are finely pleated to produce an elegant three-dimensional shape, while on the interior they are lined in smooth cotton to enhance the shirt's comfort. The cuffs have an elegant rectangular shape, while the extra long cuff openings have ornate rectangular edges. All buttons are realised in genuine mother of pearl and are engraved with the Burberry Prorsum logo. On the inside, all seams have flat fell finishing that looks very sharp while preventing them from undesirable fraying. Overall, this is a beautiful piece that demonstrates Christopher Bailey's idiosyncratic vision, blending sharp evening detailing with beautiful fabrics and an innovative cut. It is a great example of a truly luxurious evening garment that is cut to perfection and will complement any well put-together outfit.